In today’s highly competitive learning environment, children’s creativity is often hindered under the Asian education system. To nurture children’s desire to create, AppJamming Summit is hosted as an annual regional competition for the best young App developers across Asia Pacific. The Summit encourages kids to use their imagination and creativity to develop Apps of their own. “I believe every person should be empowered to use technology to express themselves and bring their ideas to life. Learning to code is a way to empower kids to dream big,” said Michelle Sun, founder of First Code Academy and the organizer of the AppJamming Summit. Anybody can start learning how to code and have the potential to make a difference on a device as simple as a tablet. Instead of just being consumers, students of primary and secondary schools, through participating in this regional competition, learned that with coding skills, they all have the equal opportunity to be creators. Computer program is the language that instructs computers and other electronic devices. Learning to code will not only open up countless career opportunities in the future, but also boost their computational thinking and problem solving skills and—more importantly—it’s fun! Talented young coders and App makers dare to dream big and turn their imagination to reality. 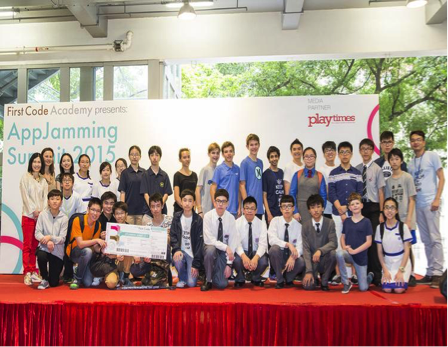 Utilizing their coding skills, budding young app developers aged 8 to 16 across Asia Pacific join the annual AppJamming Summit to build their “My Dream Home” project. During the process of creating their own Apps, they can visualize the project and watch it come to fruition. This year’s theme is My Dream Home – the finalists apps will centre around addressing innovative ideas in homes. Technology has become and is becoming an important part of our daily lives – we face multiple screens, interact with different apps simultaneously and communicate with people online everyday. In an effort to combine technology and households together, this year’s AppJamming theme is My Dream home. AppJamming Summit inspires young app makers to imagine their dream home with technology being the forefront in enhancing life inside and outside the house. At the final round on 17 April, participants will stand on the stage to pitch their ideas to the judges and audience. This gives other parents and stakeholders around the region a chance to witness what kids can create with coding. There are also tech booths and talks given by Becky Mak from Google and Greg Sung, founder of aNobii and OneSky. Limited tickets are available online (link below). After attending the first AppJamming Girls Who Code workshop, 13 year old Sarah Williams started her coding journey and built multiple Apps including the award winning app Family Calendar. She made the Family Calendar app for her family to replace her home calendar which used to be a big piece of paper on the kitchen wall, updated manually. “It was a great experience to practice public speaking in front of an audience, in a way it was like an exhibition of our work,” Sarah said after winning 1st runner up prize at the AppJamming Final in 2015. The winning team of the annual AppJamming Summit in 2016 can win a chance to participate in the MIT App Inventor Summit in the United States. Kids and teen coders can join together to share their dreams and help shape the future of this tech-driven world. Kids’ imagination and dreams deserve to be recognized and celebrated. With coding, there is no limit to the kids’ imagination.